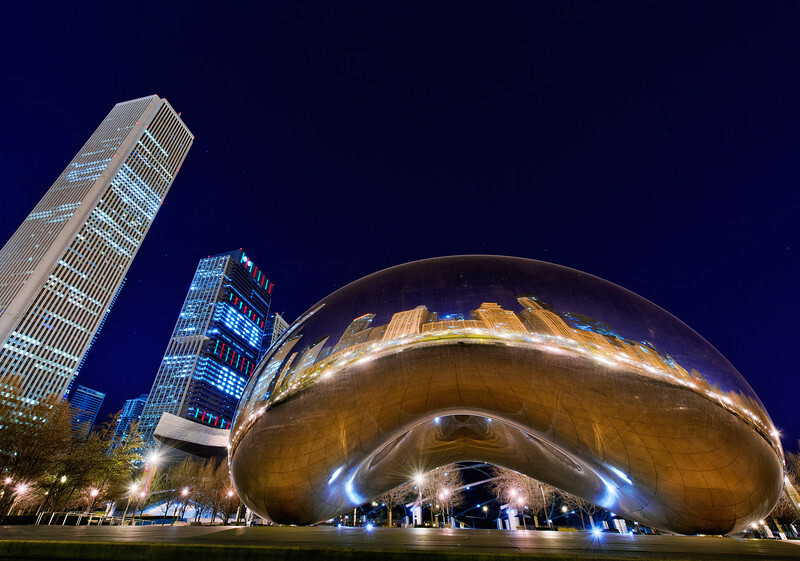 If you are Facebook friends with anyone who has ever been to Chicago, you are familiar with “the Bean.” (Someone who, I assume, had never seen the Bean named it “Cloud Gate,” so that’s its official name.) I’m fairly certain there’s a local ordinance that requires you to take a self portrait in the Bean and post it to Facebook while you’re in Chicago. On our last visit, I broke this ordinance, but luckily I had a $20 bill in my wallet when the police showed up, so nothing ended up happening. Before you Chicagoans get huffy–I love Chicago. We visit about once per month, and I far prefer Chicago to Indianapolis. It’s probably one of the few redeeming qualities of the Midwest. I do wish you all would clean this Bean, though! In order to get a clean shot of the Bean, you have to go late at night or really early in the morning. The rest of the day Millennium Park is abuzz with tourists taking self portraits in the Bean. Seriously. So, late one night when we were last in Chicago, I went to take some photos. There were a couple other photographers around, and a handful of couples taking self portraits in the Bean. We photographers were all staying out of one another’s way, and the couples were moving around enough that they ghosted out of shots, so it wasn’t a big deal that people were around. I was incredibly scared mildly amused by this, as I know Chicago police have much more important business late at night on the weekend than to detain Bean photographers. Moreover, what did she think a guy wearing a peacoat and scarf with a stash of expensive photography equipment was going to do…tag the Bean as soon as she turned her back? Still, I didn’t want to be too disrespectful, so as soon as that exposure was done, I quickly grabbed my tripod and headed out. It was a long ~10 seconds. At that point she said, “thanks, have a good night!” I guess all’s well that ends well. Not too much to say about this one. I used the Nikon D600 and the Nikon 14-24mm f/2.8. For processing, I took the -2 and +2 photos in Photoshop and layered them on top of one another. I used the -2 photo to recover some highlights that were severely over-exposed on the Bean. This allowed me to bring out the stars in the photo, which is really the only reason I posted this photo. I had such a clear, beautiful night…and the Bean is filthy!!! Oh well, at least I’m heading back again this weekend. Hopefully it will be clean this time. The photo lacked punch after my layering was done, so I did a curves adjustment to make it pop. What would you have done if you were in my shoes when security approached here? Would you have packed it up immediately? Have you had any similar situations? Share your thoughts on this topic of the day…or anything else…in the comments. One lucky commenter might become an honorary assistant to Smokey Bear! Avoid use of beverages containing caffeine and alcohol. the page to discover Kevin’s recommendation page. This is hilarious, but I’m glad you stood your ground. This is an amazing picture and one I’ve never seen of the bean. Chicago is one of my “to visit” places on my bucket list. Typically I just fold up my tripod and use it as a club to fight off security people. Actually I do the same thing that you do Tom and try to talk to security people to buy time and convince them that I have no evil intentions for whatever it is that they are guarding. Tripod as a club…now THAT is brilliant! I had my first official run in with security last month. I saw him walking over, and new what he was going to say, but I just kept to my business since i did not feel i was in a place i should not be. We had a short discussion and that was that. Best advice I could give to anyone is to stay cool and try to strike up a conversation. At the very least it can buy a few seconds for one last long exposure. Security is just doing their job and its pointless to put up a fight.